Bayani Challenge 2014 is about the bayanihan of 1 million volunteers as they rebuild disaster-affected areas around the Philippines. But it’s also about discovering the beauty of our country and having the summer of a lifetime. From students and young professionals to schools, local government officials, and even private corporations, everyone has a part to play in making the Bayani Challenge a fun, life-changing and unforgettable experience. 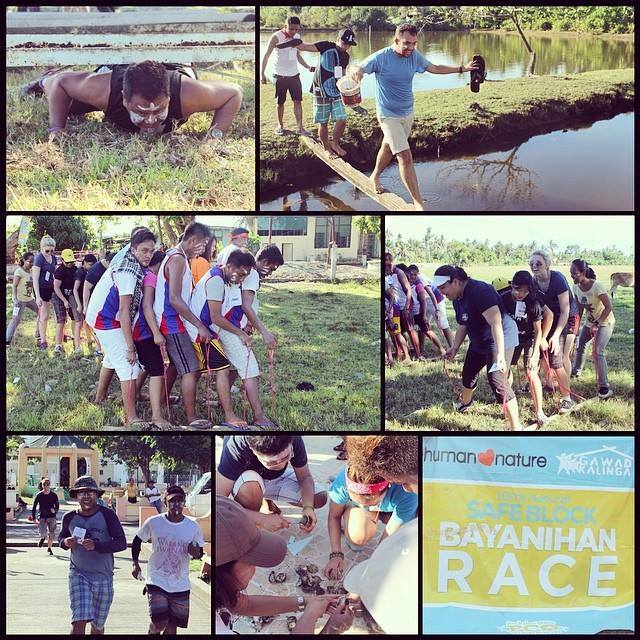 Human Nature played a big part in making this year’s Bayani Challenge possible. Apart from building their very first village in Ormoc, Leyte, sponsoring the event, and sending volunteers from their own workforce, Human Nature made the Bayani Challenge even more challenging for volunteers by helping stage the SAFEBLOCK Bayanihan Race in key locations. Safeblock is the first 100% natural and reef-friendly sunscreen in the Philippines. 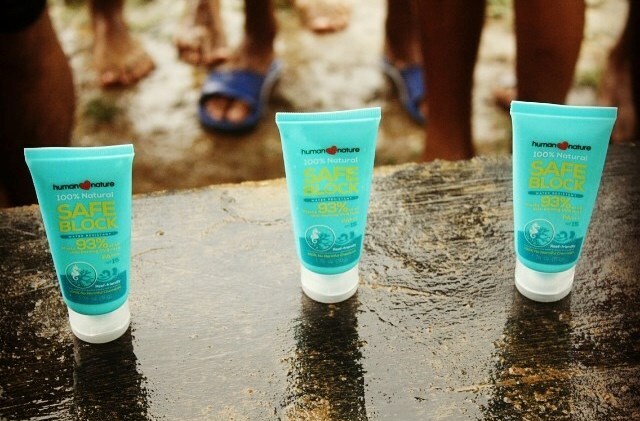 Newly launched by Human Nature, the product provided the much-needed sun protection for volunteers as they participated in the race. 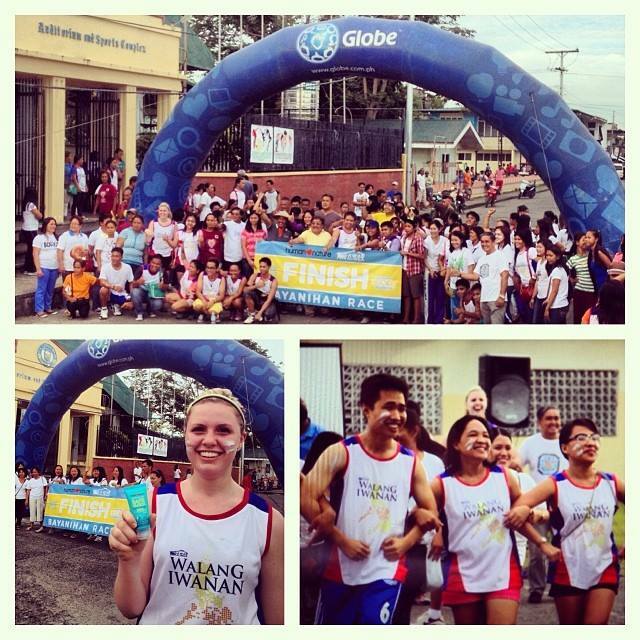 The Bayani Challenge in New Washington (Aklan) began with a fun run, participated in by hundreds of volunteers from around town, as well as some from other places – including Manila and even as far as Canada. The run, which was held on May 22, 2014, signified the volunteers’ commitment to rebuild New Washington, and was the perfect way to begin the week-long Bayani Challenge. All smiles as the volunteers finally reach the finish line. Families, soldiers, youth, and friends from all over rocked their white eco-warrior this morning! Even Mayor Peralta joined in on the fun. Thank you to our BC2014 partner Human Nature! The following day, the SAFEBLOCK Bayanihan Race happened. The race played a significant role in promoting the town’s tourist spots and important structures. It also encouraged friendly competitiveness, sportsmanship, and teamwork. Five teams of five members each had to travel via tricycles and by foot to go to eight stations/pit stops. Three teams were composed of employees from Thomson Reuters, a multinational media and information company. One team was composed of students from Trinity University in Manila while local students from the area composed the last team. Super Bibo Teams of the Bayanihan Race: Team Busilak" "Team Tsunami" "Team Echos" "Team Kristian" "Team Volunteam"
The first station required contestants to put on Human Nature’s SAFEBLOCK to protect their skins from the harsh rays of the sun but the catch is they have to wear it like an Eco Warrior. Once they have done placing the SAFEBLOCK in their faces, teams had to collect 15 flags of the same color assigned to them to get the first piece of the puzzle and their first clue. In the second station, they had to make their way by foot to the Aklan State University Administration office where they found their next task. In this station, teams had to complete an obstacle course where they had to jump and crawl over and through steel rails and also execute the Kadang-Kadang Walk. Teams had to walk with a Bamboo stick with straws as handles and they had to do this as one team. Their flexibility, strength, coordination, and teamwork were truly tested in this pit stop. 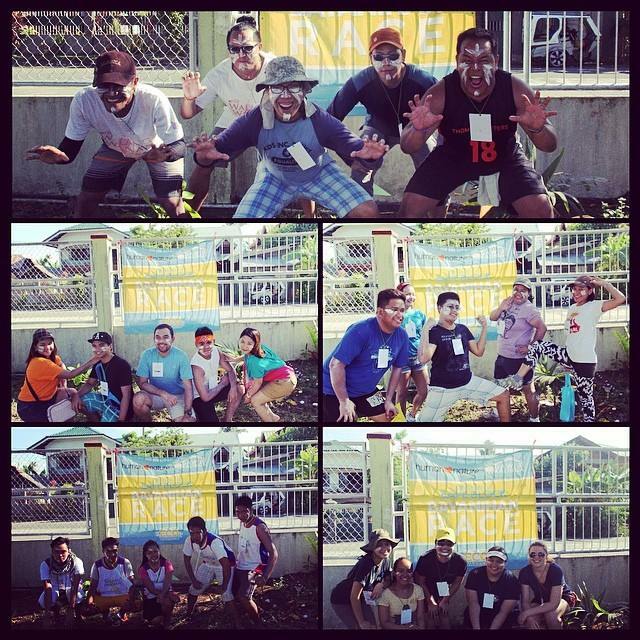 Eco Warriors dared to take on the challenges of the Safe Block Bayanihan Race! The 3rd station required the teams’ photography skills. Teams had to make their way to Sampaguita Gardens, a local resort in New Washington and using their camera phone, they had to take four photos in the different areas of the resort, each having different poses and tasks. The 4th station tested the teams’ memorization skills. New Washington is Cardinal Sin’s birthplace, and in this station, each member of the team had to answer questions about him. They could find the answers in his monument in the plaza, and once they answer correctly, they had to reapply the SAFEBLOCK on their faces. The next station was held in the ASU-CFMS Fish Pond, where they were tasked to collect univalves from the pond and they had to make sure that their buckets were half full. The 6th station was a Detour, where teams had to choose from Mollusks or Crustaceans. If they chose Mollusks, they had to open and eat up 1 kilo of oysters. If they chose Crustaceans, they had to tie five live crabs and it had to be tied correctly. Teams then had to make their way to the Auditorium and Sports Complex by tricycle, where they had to perform the Unity Dance. And on the last leg of the race, teams had to make their way to the Municipal Hall and arrange the each puzzle piece they got from each station to complete the puzzle. Everyone did the tasks with warrior-like energy and vigor, and up to the very end it was unclear which of the top three teams would win. But in the end, Team Busilak eventually finished first. 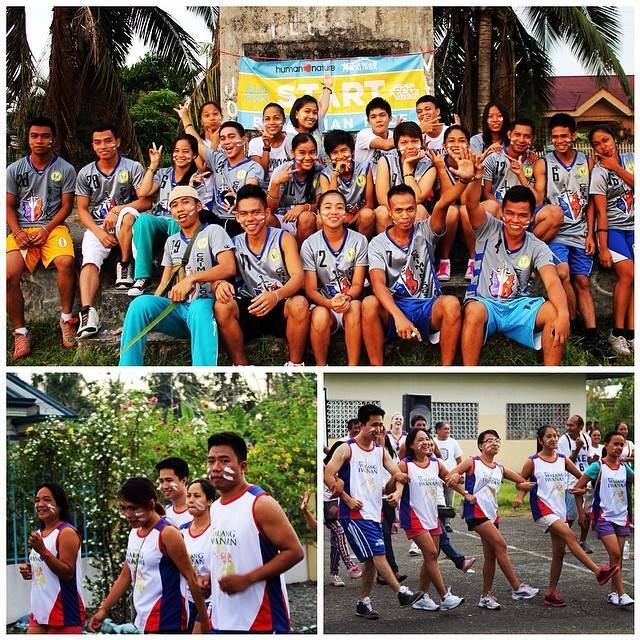 On June 7, 2014, the Luzon leg of the Bayani Challenge was held in Cavite, to accommodate volunteers from Luzon who didn’t get a chance to go to the Visayas. This time, 50 volunteers (5 teams of 10) from Manila, Cavite, and Batangas participated in the Safeblock Bayanihan Race, which was organized by the Human Nature Cavite Branch. Teams had to use Human Nature’s Safeblock to protect skin from sun damage by covering all sun-exposed areas of the body. 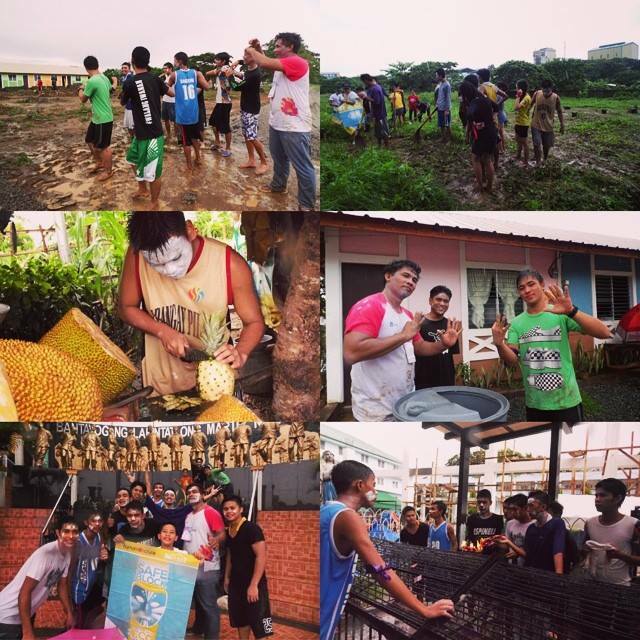 Rain or Shine, The SAFEBLOCK Bayanihan Race must go on! Like the race in Aklan, the pit stops (9 in total) featured places around Trece Martires that would also showcase the beauty of the area. The challenges included having to light candles in St. Jude Church, distributing GK and HN fliers at the Trece Martires City Market, taking pictures in the 13 Martyrs Monument, peeling and eating a pineapple from Ate Evelyn’s Fruit Stand, buying a sack of sawdust, shooting a coconut five times into the basketball ring in the GK site, singing and dancing the Unity Dance, arranging hollow blocks in the build site, planting seedlings in a plot, and collecting water from an old-fashioned pump. Teams doing the different tasks per station. 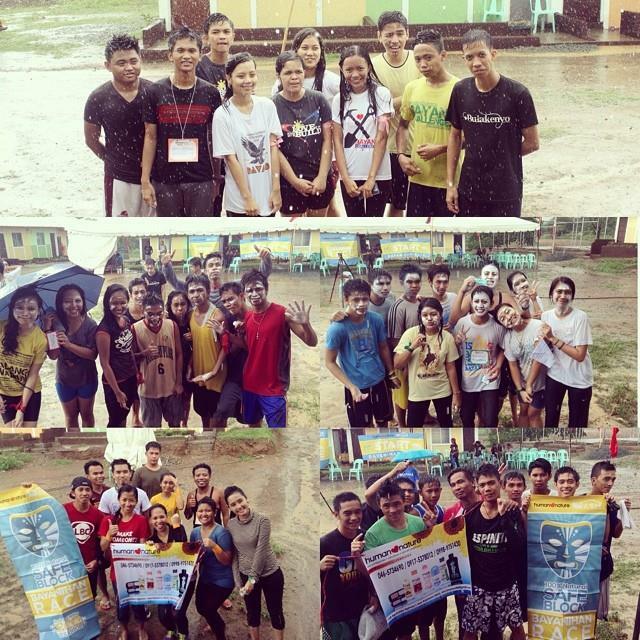 Congratulations to the five teams who survived the SAFEBLOCK Bayanihan Race! 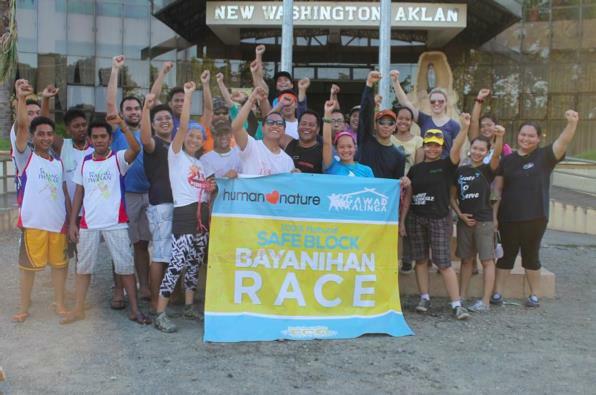 All in all, the Safeblock Bayanihan Race was a success and the volunteers really enjoyed it. In addition to helping build homes for families, the Safeblock Bayanihan Race really added to their experience, making the Bayani Challenge even more memorable. Special thanks to Human Nature and the GK local team who made both races possible! This summer, over 1 MILLION VOLUNTEERS joined hands in rebuilding Aklan, Antique, Bohol, Capiz, Cebu, Eastern Samar, Iloilo, Leyte, Negros Occidental, Palawan, Samar and Zamboanga. Click here to know more about Bayani Challenge 2014.